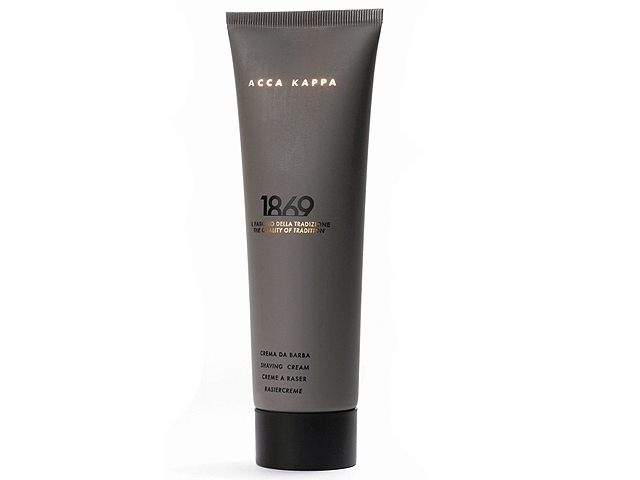 Acca Kappa's 1869 Shaving Cream is the perfect companion for tough beards. Pure vegetable oil based formula with added Hemp Seed Oil leaving skin smooth and moisturised. English Oak Extract helps to improve skin texture whilst Coconut Oil and Aloe Vera sooth and protect from irritation and razor burns. Aqua (Water), Potassium Palmitate, Potassium Stearate, Glycerin, Potassium Cocoate, Miristic Acid, Potassium Miristate, Sodium Palmitate, Sodium Stearate, Sodium Cocoate, Parfum (Fragrance), Sodium Silicate, Sodium Lauroyl Sarcosinate, Bisabolol, Benzyl Alcohol, Cannabis Sativa (Hemp Oil), Aloe Barbadensis (Aloe Extract), Quercus Robur (Oak Bark Extract), Boric Acid, Disodium Edta, Limonene, Linalool, Hydroxyisohexyl 3-Cyclohexene Carboxaldehyde, Butylphenyl Methylpropional, Bht.